Former Motorola Mobility employees in Nanjing and Beijing have organized protests in response to being let go after Google took charge by cutting 20 percent of the handset maker’s staff, Sina Tech reports. The workers claim that Motorola has breached its side of the employment contract and have documented protesting with banners outside the company’s offices. 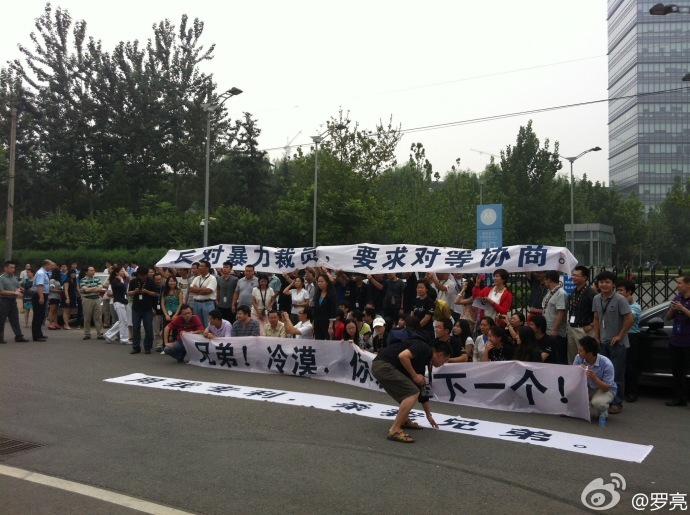 “Against Google’s illegal layoffs, defend to the death Nanjing Motorola’s home,” one banner read, according to Sina Weibo user sigpipe. 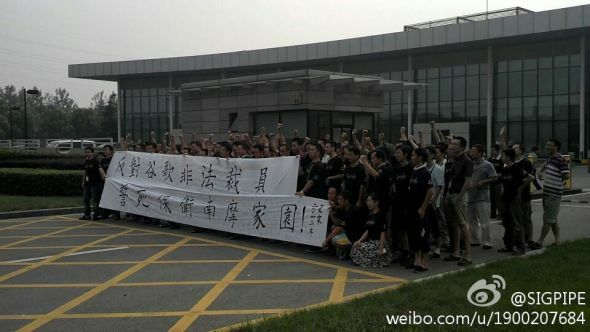 Update: Motorola workers in Beijing organized a demonstration of more than 150 people outside of a company office on Friday morning, local time. According to Sina Tech reporter Luo Liang, police and employees got in a disagreement after authorities confiscated a banner. “Use our patents to kill our brothers,” another banner accused. Google announced the cuts earlier this week, informing Motorola employees that 4,000 staff would be let go and one-third of its 94 offices closed. As many as 1,000 of those layoffs are believed to come from China, though Motorola has not confirmed the amount. “Since the contract has been terminated, there should be a negotiation. We asked to see the layoff plan, policies and other information, but the company has refused,” a spokesperson for the staff reportedly said. In an SEC filing detailing the process, Google said the cuts would cost it up to $275 million. The company also promised to provide “generous severance packages as well as outplacement services to help the employees find new jobs.” Motorola China is reportedly planning a job fair for its dismissed employees early next month. Today, Motorola Mobility announced that its reducing its headcount by approximately 4,000. Two-thirds of the reduction is set to occur outside of the U.S. In addition, Motorola plans to close or consolidate about one-third of its 90 facilities as well as simplify its mobile product portfolio–shifting the emphasis from feature phones to more innovative and profitable devices. Google and Motorola announced the $12.5 billion acquisition deal. Somewhat ironically given current events, the merger was held up by a Chinese regulatory body that required concessions before red-stamping it. The deal finally closed in May.